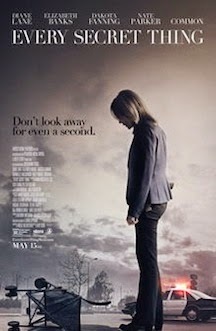 Movie Review: “Every Secret Thing” starts holding our attention by presenting a promising package of drama and crime, but sooner than we expected and even before totally unwrapped, it becomes a huge disappointment. In truth, the potential of this story, adapted by Nicole Holofcener - the competent writer/director of “Please Give” and “Enough Said” - from a crime novel of the same name by the American author Laura Lippman, is totally inhibited by an unsuccessful direction, screenwriting, and cinematography. Only the casting, with diligent performances from Danielle Macdonald and Dakota Fanning, was passable. The film, produced by the celebrated actress Frances McDormand, was directed by Amy Berg, who deserved accolade for chronicling two disturbing legitimate cases in the documentaries “Deliver Us From Evil” (2006) and “West of Memphis” (2012), but showed serious gaps in this first fictional feature-length. The plot brings out two neighbor friends, the apparently reasonable Alice and the unmannerly Ronny, who were implicated in the disappearance of a baby child, taken from a stroller that was placed in the porch of a house close to theirs. Both were sent to a correction facility for seven years. Now with 18, they’re back, but is Alice who causes polemics by saying she has paid for a crime she didn’t commit. When another 3-year-old is missing, detectives Kevin Jones and Nancy Porter get back to the two teens, who become suspects once again. Everything was poorly done, starting with the messed-up plot and crooked details, going through a disintegrated structure and melancholic undertones, and finishing in its unappealing dark images. A couple of twists resulted pathetically inefficient since everything is too revelatory and the surprises are null. If you’re craving for mystery and thrills, skip this one.